Many of you know that I’m a huge fan of the trolls in WOW and Vol’jin in particular. That’s why I’m really excited about the little bit of information that came out of the CDev Reddit AMA thing that happened today. 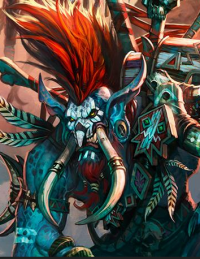 Evidently the next WOW novel is about Vol’jin and I assume will be released around the time that patch 5.1 goes live. They didn’t announce who is writing it though. How many novels are planned to be released over this expansion? Also, since you have stated Garrosh is the main antagonist during your big MoP reveal, do you feel you’ve hurt opportunities to write more exciting novels to build up this already hyped epic battle we will eventually experience in-game? I’m glad you enjoyed the novel! Golden is a fantastic author who works very closely with us to do justice to the franchise. I wonder if we’ll get a scenario for that one. I hope so.